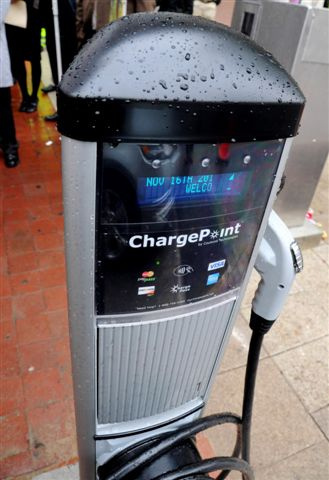 Our Nation's Capital is doing its part to ensure that the charging infrastructure will be in place for the electric vehicles rolling out of dealer parking lots soon. Drivers of the Nissan Leaf, Chevrolet Volt, Tesla Roadster and Model S, CODA and the Ford Focus Electric will already have one charging station in The District. Last Tuesday the city's first EV charging station was unveiled by outgoing Mayor Adrien Fenty, Department of Energy Undersecretary Cathy Zoi and District Department of Transportation Director Gabe Klein. It is located at the Franklin D. Reeves Center near 14th and U streets Northwest. The station was built thanks to a $15 million Department of Energy grant that will make possible 4,600 charging stations around the country. Click here for more pictures from the event. The Philadelphia Eagles has plans to power Lincoln Financial Field with a combination of on-site wind, solar and dual-fuel generated electricity, which would make it the world’s first major sports stadium to convert to 100-percent on-site renewable energy. A joint task force has determined that Metro's governance structure is outdated, lacks accountability and has "contributed to its decline." On Monday morning, District Department of Transportation Director Gabe Klein sat at a dais at the Metropolitan Washington Council of Governments boardroom, next to the Dutch ambassador and other Netherlandish dignitaries. They were there to talk about how their country makes it easy to bicycle, before mobile workshops that would assess D.C.’s bike friendliness. The heads of the Interior Department and National Park Service signed a final plan for the restoration and improvement of the National Mall on Tuesday, setting the vision for the 684 acres known as America’s front yard. Here's what the troubled Potomac River needs to get healthy, according to a report released Thursday by a group devoted to protecting it: more forests and farmland to filter toxic rainwater. Electronic displays at bus stops, more dedicated bus lanes, bus priority at traffic signals, a new express bus route, and more improvements are all on the way, according to representatives from DDOT and WMATA.